The 1989 film adaptation of Stephen King’s Pet Sematary stayed incredibly true to the novel. That’s in large part due to the fact King adapted his own work for the screen. The horrormeister himself claims Pet Sematary as his scariest novel and the first movie remains a must-see for King fans. King was inspired to write Pet Sematary after his daughter’s cat was killed by a truck outside a rented house in Orrington. He took the true story of a major truck route steps away from a family’s front yard, combined that with an actual pet cemetery that existed behind the rented home, and twisted the real-life outcome to replace a pet’s death with that of a child as the trigger for the novel’s terrifying third act. The devastating loss of a child, our relationship with mortality, and how we process grief remains at the heart of both the 1989 film adaptation and the 2019 version hitting theaters on April 5th. What would a parent do if they were presented with the option of saving their child from dealing with death by bringing back a beloved pet? And what decision would you make if you could resurrect a child taken far too soon, knowing they’ll come back from the dead changed? The Creed family is forced to answer those questions after moving from bustling Boston to a quiet rural town where dad Louis (Jason Clarke) has taken a position as a doctor at a college. Louis has moved his family – mom Rachel (Amy Seimetz), daughter Ellie (Jeté Laurence), and son Gage (played by Hugo and Lucas Lavoie) – away from the stress of the big city just so he can spend more time enjoying his wife and kids. The Creeds settle into a large, comfy home surrounded by woods. Unfortunately, their new domicile is yards away from a road used by big rigs speeding to their destinations. Their property is also the home of a decades-old pet cemetery, a fact they learn within days of moving in. Children in animal masks and carrying a dead dog have a procession through their property, and inquisitive Ellie jumps on the first possible opportunity to sneak out and follow their trail. She discovers the cemetery and is drawn to a barrier of tree branches at its rear. Fortunately, the Creeds’ nearest neighbor, Jud Crandall (John Lithgow), stops Ellie from exploring where no child should set foot. Jud, a widower, quickly becomes a friend of the entire Creed family, passing on his first-hand knowledge of the power of what lies beyond the “Pet Sematary” to Louis. It’s not long after the family’s settled in that Ellie’s beloved cat, Church – a gorgeous, fluffy purr machine – is found dead, the victim of a passing truck. Of course, Jud and Louis make a late-night trek to the area off-limits behind the pet cemetery instead of breaking Ellie’s heart with the news of her cat’s death. And, of course, Church comes back a changed cat. He’s no longer a cuddlebug; this feline member of the walking dead stinks, has bloody, matted fur, and a new sour disposition. After Church’s death we learn Rachel’s relationship with death is deeply complicated. Her sister, Zelda, suffered from a devastating illness and died when Rachel was just a child. Prior to her passing, Zelda’s gnarled appearance was nightmare-inducing. Rachel’s guilt at being the cause of her sister’s death not only haunts her dreams but has also shaped how she deals with loss. The 2019 film strays from Stephen King’s novel by switching up the next unfortunate victim. The crucial events in King’s tale were driven by the horrific death of young Gage. In 2019, Ellie dies in the road while yards away from family and friends gathered to celebrate her birthday. With a grieving Rachel fleeing town with Gage, Louis is given the opportunity to cheat death. Ellie’s death presents Louis with the agonizing decision: should he toss morality and mortality away, take his daughter to the ancient burial ground past the pet cemetery, and hope for the return of his Ellie and not some abomination? Even if you haven’t read the novel or watched the original feature film, nothing in the above summary’s a spoiler. It’s all been laid out in the film’s multiple trailers which were obviously pieced together with the assumption the target audience has more than a passing knowledge of the plot. The meat of King’s story remains in place with the 2019 adaptation, although the path to getting there takes a few side roads. What’s not necessarily obvious from the trailers leading up to the April 2019 theatrical release is that this version minimizes Rachel’s backstory. Characters are missing who were crucial to understanding the relationship between Rachel and Louis, as well as the relationship Jud has to the ancient burial ground. In many ways this version feels like a CliffsNotes take on the central characters, with the exception of Ellie. Altering the story to place Ellie as the victim is both an understandable and effective choice. Ellie, played by the film’s breakout star, Jeté Laurence, is better able to display a myriad of emotions upon being brought back from the dead as opposed to the limited ability to bring to the screen any complicated layers due to Gage’s tender age. Yet while directors Kevin Kolsch and Dennis Widmyer remained true to the intent of King’s work, there’s an ingredient missing that could have lead to a real emotional connection with the family in this 2019 version. Jason Clarke’s performance is too restrained and disengaged to truly elicit the necessary sympathetic (and empathetic) reaction to his dilemma. Amy Seimetz’s Rachel is much more compelling and relatable, even with her backstory glossed over. The original film stands the test of time, which means in order to justify a remake this 2019 version has to knock your socks off by delivering something complicated and horrifying. There are a few decent jump scares in this latest adaptation, but there are also annoying plot threads left dangling. 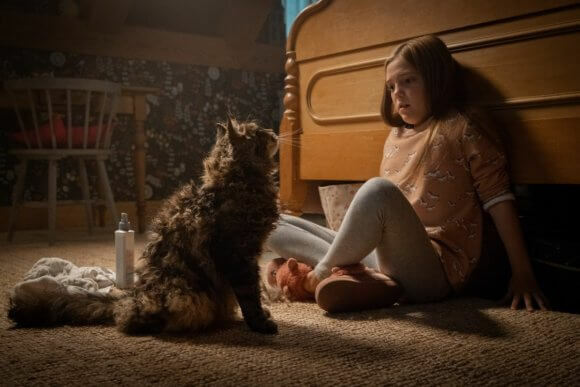 2019’s Pet Sematary isn’t a better film than 1989’s version and ultimately feels like an unnecessary remake that fails to improve upon the original adaptation.